Plus, an app for settling the check launches in the Bay Area, and Los Cilantros opens in South Berkeley. The new Kingfish will look just like this. 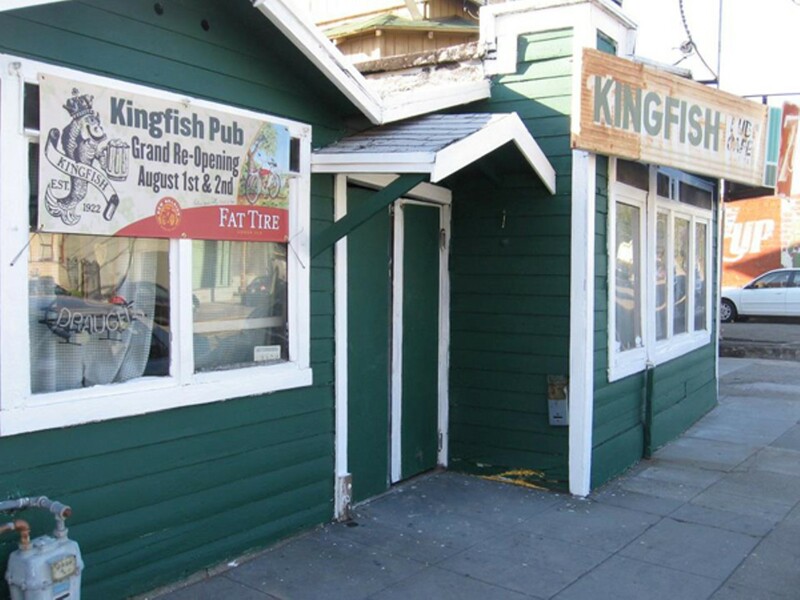 First, the bad news: The Kingfish Pub (5227 Claremont Ave., Oakland), a beloved dive bar in Temescal, is going to have to move in order to make way for a new condominium complex. The good news: The pub's owners have already found a new home for the tiny, 92-year-old bait-shop-turned-watering-hole, practically right across the street. Later this year, they hope to move the Kingfish — to literally pick the whole building up and set it down at the new site. If all goes according to plan, the new Kingfish will be the same as the old — the same green paint job, shack-like exterior, oversized 7-Up sign, and happy customers. Talk of demolishing the Kingfish in order to make way for condos has been going on for years, but the project was waylaid due to the down economy. Now, the owners of the property have sold it to developers who are moving forward with the plan, and they've given the pub their ten-month notice. 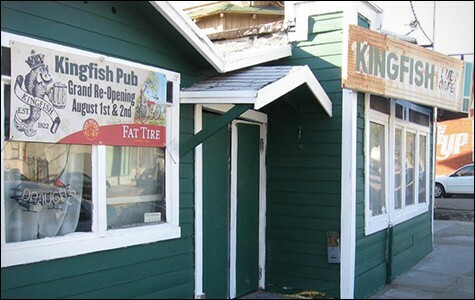 Owners Mike Bowler and Emil Peinert — two longtime bar patrons who took over the Kingfish's lease in 2009, saving the pub from being lost to history a first time — hope the proposed move will save it again. They've agreed on terms to purchase an unused building at 5239 Telegraph Avenue, a former Ethiopian restaurant located next door to the Tool Lending Library. The plan, Bowler said, is to tear down the restaurant and put the Kingfish in its place. There should even be enough room to add a small patio in back. Bowler and Peinert said they hope to complete the move sometime in the fall. In the meantime, the Kingfish will remain open at its current spot. All of this is pending city approval, of course. As daunting as the idea of picking up an entire building and moving it sounds, Peinert said that will be the easy part. "The red tape is probably actually more challenging than the physical process," he said. Because of the Kingfish's designation as a historical building, Peinert expects that he and Bowler won't be required to make extensive upgrades before they reopen the pub. They'll add an ADA-compliant bathroom and make a few safety improvements, but otherwise the building will remain largely unchanged. For bar regulars, some of whom have been frequenting the Kingfish for decades, that can only be a good thing. "We're planning on keeping the shack looking like the shack it is," Bowler said. Anyone who's ever been frustrated while attempting to hail a waiter to pay the bill at the end of a meal might want to try Cover, an app that allows diners to settle their check via smartphone. Eight months after its initial launch in New York, Cover made its Bay Area debut last week, starting with an initial roster of about twenty mostly high-end restaurants, including Daniel Patterson's three Oakland establishments: Haven, Plum Bar, and the newly revamped Ume. According to Cover co-founder Mark Egerman, the idea behind the app is to make the process of paying at a restaurant as seamless as possible. "Cover is a way for restaurants to provide the best experience for customers — to take the dining experience and make it feel special," he said, adding that the service was inspired by the popular car-hailing app Uber. Like Uber, Cover stores users' credit card information and a default tip percentage. Once seated at the restaurant, you check in and alert your server that you're using the app. At the end of the meal, you can sip your coffee or digestif at your leisure, and then simply walk away. Your credit card gets charged automatically, and you never even look at an itemized check. (This, of course, also means you're trusting the restaurant to get the bill right.) For group diners, the app will split the check — evenly by default, though you can adjust those settings. Egerman stressed that, unlike Uber, Cover isn't a "luxury product," and diners don't pay anything for the service. Instead, the company makes money by charging the restaurants a percentage fee that's comparable to the processing fees they'd otherwise have to pay to the credit card companies. In an email, Patterson said Cover integrated seamlessly into his restaurants' existing payment systems. Cover is one of a handful of mobile-payment systems currently vying to make inroads in the Bay Area. Other contenders include Tabbed Out, which has less of a fine-dining focus, and the online-reservations behemoth OpenTable, which is piloting a payment app of its own. A Mexican restaurant called Los Cilantros has opened inside La Peña Cultural Center (3105 Shattuck Ave., Berkeley), Inside Scoop reported. Chef-owner Dilsa Lugo, a longtime caterer, was able to open the restaurant with the help of La Cocina, the San Francisco-based food-business incubator. The breakfast menu, which includes quesadillas estilo tres marias (fried breakfast quesadillas stuffed with green peppers and Oaxacan cheese) and molletes (toasted Acme bread covered with refried beans and other toppings), looks especially interesting. Current hours are 8 a.m. to 2 p.m., Tuesday through Sunday.